Much like flipping your light switch at home—only on a scale 1,000 times smaller than a human hair—an ASU-led team has now developed the first controllable DNA switch to regulate the flow of electricity within a single, atomic-sized molecule. The new study, led by ASU Biodesign Institute researcher Nongjian Tao, was published in the advanced online journal Nature Communications. Engineers often think of electricity like water, and the research team’s new DNA switch acts to control the flow of electrons on and off, just like water coming out of a faucet. Previously, Tao’s research group had made several discoveries to understand and manipulate DNA to more finely tune the flow of electricity through it. They found they could make DNA behave in different ways—and could cajole electrons to flow like waves according to quantum mechanics, or “hop” like rabbits in the way electricity in a copper wire works —creating an exciting new avenue for DNA-based, nano-electronic applications. Tao assembled a multidisciplinary team for the project, including ASU postdoctoral student Limin Xiang and Li Yueqi performing bench experiments, Julio Palma working on the theoretical framework, with further help and oversight from collaborators Vladimiro Mujica (ASU) and Mark Ratner (Northwestern University). To accomplish their engineering feat, Tao’s group, modified just one of DNA’s iconic double helix chemical letters, abbreviated as A, C, T or G, with another chemical group, called anthraquinone (Aq). Anthraquinone is a three-ringed carbon structure that can be inserted in between DNA base pairs but contains what chemists call a redox group (short for reduction, or gaining electrons or oxidation, losing electrons). These chemical groups are also the foundation for how our bodies’ convert chemical energy through switches that send all of the electrical pulses in our brains, our hearts and communicate signals within every cell that may be implicated in the most prevalent diseases. 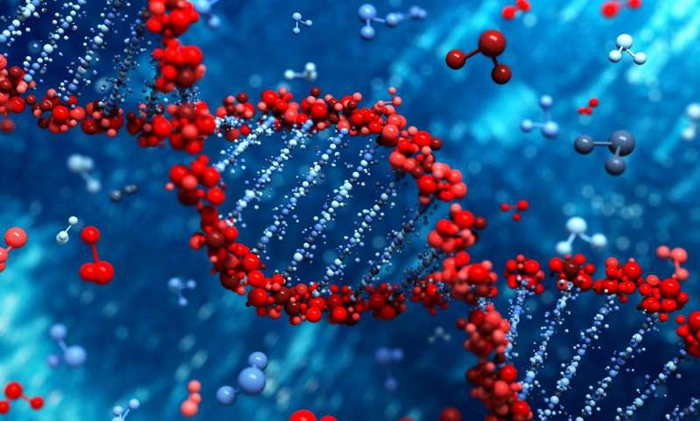 The modified Aq-DNA helix could now help it perform the switch, slipping comfortably in between the rungs that make up the ladder of the DNA helix, and bestowing it with a new found ability to reversibly gain or lose electrons. Through their studies, when they sandwiched the DNA between a pair of electrodes, they careful controlled their electrical field and measured the ability of the modified DNA to conduct electricity. This was performed using a staple of nano-electronics, a scanning tunneling microscope, which acts like the tip of an electrode to complete a connection, being repeatedly pulled in and out of contact with the DNA molecules in the solution like a finger touching a water droplet. “We found the electron transport mechanism in the present anthraquinone-DNA system favors electron “hopping” via anthraquinone and stacked DNA bases,” said Tao. In addition, they found they could reversibly control the conductance states to make the DNA switch on (high-conductance) or switch-off (low conductance). When anthraquinone has gained the most electrons (its most-reduced state), it is far more conductive, and the team finely mapped out a 3D picture to account for how anthraquinone controlled the electrical state of the DNA. For their next project, they hope to extend their studies to get one step closer toward making DNA nano-devices a reality. “We are particularly excited that the engineered DNA provides a nice tool to examine redox reaction kinetics, and thermodynamics the single molecule level,” said Tao.